Eric Deggans is NPR’s first full-time TV critic, crafting stories and commentaries for the network’s shows, including Morning Edition, Here & Now and All Things Considered, along with writing material for NPR.org and the website’s blogs. He also serves as a media analyst and contributor for MSNBC and NBC News. Eric came to NPR in September 2013 from the Tampa Bay Times newspaper in Florida, where he served as TV/Media Critic and in other roles for nearly 20 years. He is also author of Race-Baiter: How the Media Wields Dangerous Words to Divide a Nation, a look at how prejudice, racism and sexism fuels modern media, published in October 2012 by Palgrave Macmillan. He guest hosted CNN’s media analysis show Reliable Sources several times in 2013. 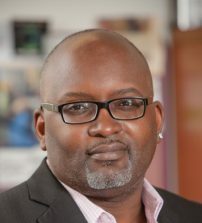 He has also earned awards from the Florida Press Club, The Media School at Indiana University, the Tampa Bay Association of Black Journalists and the National Association of Black Journalists’ A&E Task Force. Eric also serves as chairman of the board of educators, journalists and media experts who select the George Foster Peabody Awards for excellence in electronic media. Eric joined a prestigious group of contributors to the first ethics book created in a partnership between Craiglist founder Craig Newmark and the Poynter Institute for Media Studies. Developed as Poynter’s first ethics book for the digital age, The New Ethics of Journalism was published in August 2013 by Sage/CQ Press. Born in Washington D.C. but raised in Gary, Ind., Eric has contributed as a pundit, freelance writer or essayist to many media outlets, including, The New York Times online; POLITICO; NBC Nightly News, CBS This Morning; The NewsHour (PBS) and a host of public radio platforms. He is based in Saint Petersburg, Florida with an office inside The Poynter Institute for Media studies.